Last summer Dale Tronrud, a postdoc in the Karplus Lab, suggested Little Belnap Crater for the Biochemistry and Biophysics Department’s annual hike. 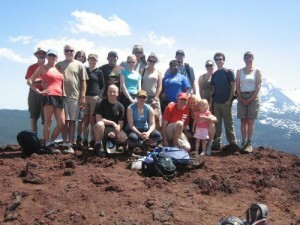 A group of about twenty faculty members, postdocs, grads, friends and family drove to the trailhead near the McKensie Pass and hiked about two miles across the lava beds to the top of Little Belnap. They had lunch on top and took in the spectacular views. On the way home, they stopped at Gary Merrill’s favorite swimming spot High Rock where many of them cooled off by jumping off rocks into the chilly South Santiam River. © 2019 Half-Life, all rights reserved.